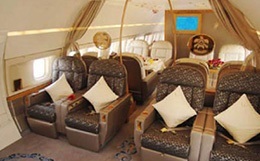 Due to our extensive network of Boeing Business Jets and Boeing aircraft operators, each aircraft is unique in itself but most can pamper up to 18 people very comfortably and feature luxurious amenities such as a spacious living room, master bedroom suite, second bedroom/office, three lavatories as well as a roomy galley and crew rest area. 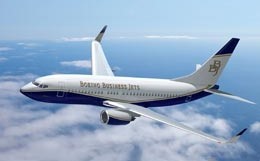 Similar layouts and space are available on many Boeing Business Jet aircraft that we deliver to include the original Boeing Business Jet, the Boeing Business Jet 2 and the Boeing Business Jet 3. Amenities vary by aircraft but can include entertainment systems, TVs, DVD and VCR players, and stereo audio systems. Satellite telecommunications capabilities on most aircraft include e-mail, teleconferencing, live TV and a plain paper fax machine. With a top cruise speed of 528mph and a range of 6045 nautical miles, this exclusive aircraft is the ultimate in space, range, utility, and productivity and can whisk you from L.A. to London, New York to Madrid or Paris to Tokyo in the utmost comfort and luxury. 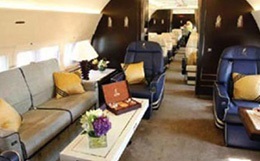 With nearly triple the space of other executive jets, a non-stop range that easily covers New York to Honolulu, Cairo, or Buenos Aires, and a refreshingly home-like interior, including a queen-size bed suite, up to 2 full-height showers and living, dining, and conference rooms, the BBJ is known as the ultimate in business jets. 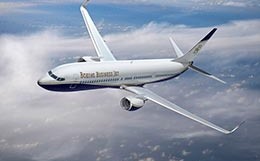 The BBJ 2 is approximately 19 feet longer than the original BBJ, with 25 percent more cabin space and double the cargo space. With dual General Electric/Snecma CFM56-7 engines, the BBJ2 is capable of traveling long distances at high speeds. The new Max platform will also offer 12% more fuel efficiency. 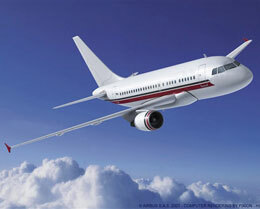 Accordingly, this will reduce operating costs and increase range when compared to the original BBJ. 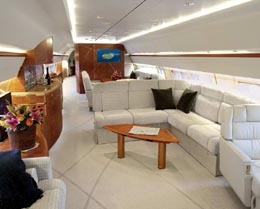 Furthermore, the BBJ2 also travels faster and quieter. 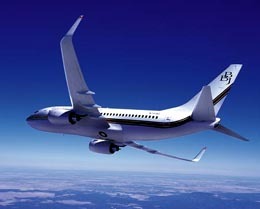 The BBJ 3 is the largest BBJ and features an impressive intercontinental range. The BBJ3 is powered by dual GE/Snecma CFM56-7B27 engines, which each provide over 24,300 lbs of thrust. Larger than its predecessor (BBJ2) in both external size and interior cabin, the BBJ3 was designed to offer the same exceptional performance in a larger package. For more information about chartering, leasing or buying a Boeing Business Jet please contact us by calling +44-20-3874-8091 or send us an email here.